NOTICE: Activation key must be used on a valid Steam account. 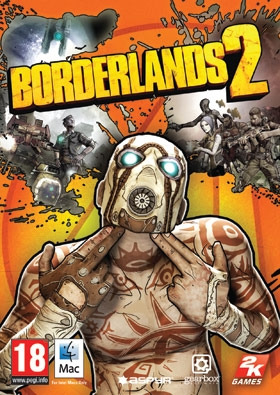 Requires internet connection.ABOUT THE GAMEBorderlands 2 follows the story of four new Vault Hunters as they fight to free Pandora from the clutches of Handsome Jack, the brilliant, charismatic, and utterly despicable CEO of the Hyperion Corporation. Players will fight across the whole of Pandora to stop Jack from awakening an ancient a… lien evil known only as the Warrior. Their quest will bring them into contact with some familiar faces from the old game – most notably, the original four Vault Hunters: Roland, Lilith, Brick and Mordecai. They, along with some brand new characters, will help players defeat Jack, destroy the Warrior, and save Pandora.KEY FEATURES All-New Characters and All-New Classes: Four all new playable classes including the Siren, the Commando, the Gunzerker and the Assassin. Step into the role of the Gunzerker, whose highly deadly skills allow him to dual-wield any two weapons found in the game. Not only that, you will build on that skill to do more things with two guns than you ever imagined possible. Dual machine guns? Cool. Dual rocket launchers? Of course! Dual Sniper Rifles? Sure, if that’s your thing! Want to try other styles? More tactical perhaps? There are multiple classes to choose from! Play Online with Friends: Share your adventures with friends both online and via LAN through a seamless system enabling you to drop in and drop out of a campaign without ever having to restart the game. World Connected Story: Left for dead in the frozen tundra of Pandora, begin your quest of revenge and redemption as the story drives you closer to the Hyperion Corporation and its evil founder, Handsome Jack. New Badass Gun System: Millions upon millions of possible weapons means tons of new and innovative ways to engage foes on Pandora. Fire, electricity, corrosive acid, and more will all be at your disposal. 87 Bazillion...Everything: In addition to the new gun system, you will lust after procedurally generated shields, grenades, Relics, class mods and much, much more. And you thought the original Borderlands had a ton of loot! Brand new environments: From the arctic tundra, through the dangerous grasslands, past the mysterious corrosive caverns to beyond, discover more of the unpredictable world of Pandora at every turn! Brand new enemies: Hulking, gorilla-like Bullymongs, vicious predatory Stalkers and the Hyperion mechanical army, run by Handsome Jack, are just some of the new enemies you will face. SYSTEM REQUIREMENTS Minimum: Operating System: 10.7.5 (Lion), 10.8.2 (Mountain Lion) CPU Processor: Intel Core 2 Duo (Dual-Core) CPU Speed: 2.2 GHz Memory: 4 GB RAM Hard Disk Space: 13 GB Video Card (ATI): Radeon HD 2600 Video Card (NVidia): Geforce 8800 Video Memory (VRam): 256 MB Peripherals: Macintosh mouse and keyboardRecommended: CPU Processor: Intel Quad Core CPU Speed: 2.4 GHz Memory: 4 GB RAM Video Memory (VRam):512 MBSupported Video Cards: NVIDIA GeForce® 8800, GT 120, 320M, 330M, 650M ATI Radeon HD 3870, HD 4670, HD 4850, HD 5670, HD 5750, HD 5770, HD 5870, HD 6630, HD 6490, HD 6750, HD 6770, HD 6970Intel HD Graphics 3000, 4000The following video chipsets are unsupported for Borderlands 2:ATI Radeon HD 2000 seriesNVIDIA 8600MNVIDIA 9400M, 9600MNOTICES:- Gamepad Support: Borderlands 2 supports the Xbox 360 wired gamepad only.- Apple original CPU's only, CPU upgrades not supported.- Apple Intel Chipsets only. Power PC Processors (G4 and G5) are not supported.- This game is not supported on volumes formatted as Mac OS Extended (Case Sensitive) Unauthorized copying, reverse engineering, transmission, public performance, rental, pay for play, or circumvention of copy protection is strictly prohibited © 2012 Gearbox Software, LLC. Published and distributed by 2K Games. Gearbox Software, Borderlands, and the Gearbox and Borderlands logos are trademarks of Gearbox Software, LLC. 2K Games and the 2K Games logo are trademarks of 2K Games in the US and/or other countries. Unreal, the circle-U logo and the Powered by Unreal Technology logo are trademarks or registered trademarks of Epic Games, Inc. in the United States and elsewhere. Uses Bink Video. Copyright © 1997-2012 by RAD Game Tools, Inc. This software product includes Autodesk® Scaleform® software, © 2012 Autodesk, Inc. Autodesk and Scaleform are registered trademarks or trademarks of Autodesk, Inc., and/or its subsidiaries and/or affiliates in the USA and/or other countries. Powered by Wwise © 2006 - 2012 Audiokinetic Inc. © 2012 NVIDIA Corporation. NVIDIA, the NVIDIA logo, GeForce, PhysX, The way it’s meant to be played, and 3D Vision are trademarks and/or registered trademarks of NVIDIA Corporation. Published and distributed by Aspyr Media, Inc. “Aspyr” and the Aspyr “star” logo are federally registered trademarks of Aspyr Media, Inc. Mac and the Mac logo are trademarks of Apple Computer, Inc., registered in the U.S. and other countries. The ratings icon is a trademark of the Entertainment Software Association. All other marks and trademarks are the property of their respective owners. Non-transferable access to special features such as exclusive, unlockable, downloadable or online content, services, or functions may require single-use serial code, additional fee and/or online account registration (17+). Access to special features may require internet connection, may not be available to all users, and may, upon 30 days notice, be terminated, modified or offered under different terms. ne play and download requires broadband internet service. User responsible for associated fees. All rights reserved.